One of my best buddies since my days of wine and roses wiping and diapering babies buns, is being put to rest. Some of you East Coasters (except the Carolinas...that would be you, Nickypoo) won't have a clue about my despondency....but let me tell you, it's real. 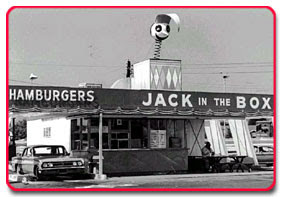 Jack in The Box, originating in San Diego was the first drive thru fast food restaurant chain in California. Not to be confused with drive-up.....drive thru was just that...you drove thru....sort of. 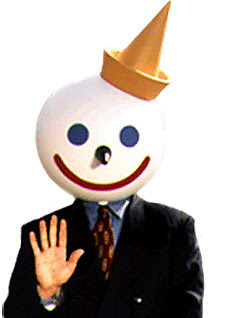 And Jack in The Box looked like a Jack in the box. Jack rose above the smog roar of the city...you could spot him a mile away. 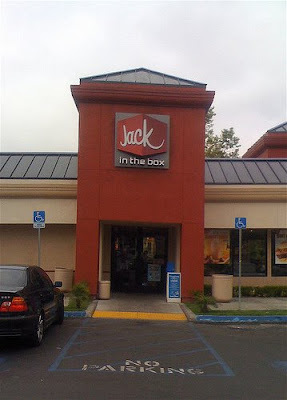 Driving down any major street children cried out from the back seat...."Mama, lookie...there's Jack-in-The Box!" And mothers would smile as they navigated their Buick station wagon towards the burger joint. But the box was elevated high up into the stratosphere known as the sky. This made the children and their parents happy. Over the years, Jack gained popularity and clout. His reputation reached far into the Western states....and up the coast. As I followed his notoriety, across state lines, Jack never disappointed me. I had a bumper sticker just like this on my car. Over the last couple of years, Jack's image grew bland, but his food did not.....still, I missed his smile. 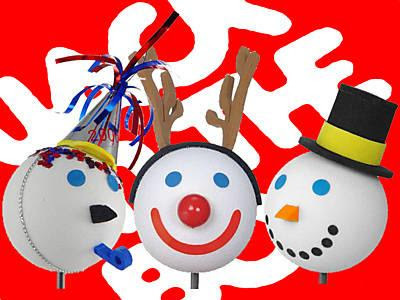 But I still had antenna balls....these are from the Christmas/New Years circa 2006. But recently it was brought to my attention that I wouldn't have to worry about his smile anymore....at all. Don't forget to check out the fundraiser raffle at ELEMENTO-P. New items are being added daily. We always called it "Crap in a Box" but I understand your lament at the loss. It was an icon, a staple in Texas. And the commericals were funny! 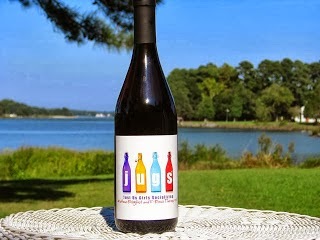 Guess what...one summer they let me leave the state of Virginia. I flew to San Antonio and drove up to Bandera, and we stopped at a Jack in the Box and got a taco (I think, don't quote me on that). Let me know where I can send flowers. I suppose it is the same burial ground as the Colonel. You can't just get rid of an icon - that's just wrong! I could make my college roommate throw up by just talking about those nasty fried tacos they have. One word about them and she started gagging. Good times! Bye Bye Jack! That makes me sad, too. I remember one in Orange County (when I was little) where the speaker was actually JACK--and you spoke "into" him. That new look is BLAND! Oh, don't you just hate some changes??? I remember this place in either TX or AZ...not sure which. I did love the antenna balls too, very cute. We have definitley heard about Jack hear on the east coast, but never had the experience. Sorry for your loss. I am sure the original Jack was offending some group or something. Sorry ... should have spelled "definitely" ... idiot. What a coincidence, My Honey and the kids got me a Jack antanae ball just this weekend. He is not dead here, very much alive, loving the new commercials. Have you seen his "hairdo" in the new Terriyaki Bowl ads? It actually reminds me of you, circa 1977. A huge fan of Jack's greasy fried tacos! Tacos from Jack in the Box, yummmmmmm! 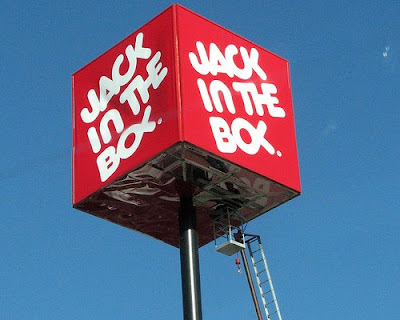 I hope I didn't confuse anyone...but the Jack-in-The-Box restaurants are alive and well. They are still thriving with thousands of units. They even have about 15 in Austin for Cortney! They are getting rid of the image of Jack...using just the name. I'm sure Jack will still be the official spokesperson with plenty of those hilarious commercials. I cant wait to see the Teryaki one! And the tacos...everything you want...grease, faux meat, and still 2 for 99 cents. Suz, I know people who collect those balls. I know some of the rare ones are very expensive on Ebay. If they ever go away, the world as we know it will explode or something. CBW, Jack grows on people just like the Col.
Just "Jack"? How did I miss this newsflash...I live in So. Cal? 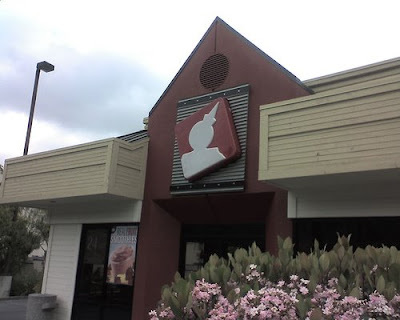 I really need to visit California because I have NEVER had Jack in the Box. I mean, seriously, I am SO THIN and GORGEOUS, I really do need to try Jack in the Box : ). Do you have them in Texas? Poor Jack left Philly many many moons ago. Oh how I remember drunken nights in the drive through ordering their onion rings. Somehow, I managed to not live in a Jack In the Box state. I see I have missed quite a lot. It was only this year that I had a In N Out burger...now that is delish! I love it when Heart Shaped Hedges contributes. I wonder if she has a photo of that 70's hairstyle? If you didn't want to show us, perhaps you could super-impose it on Phillip Johnny Bob? What??!! 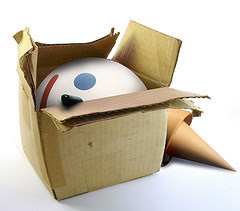 OOOOOOOOOOO, I was sick when they blew him up years ago....now I will be even sadder that I can't buy a Jack head antenna ball to use as pointers in my class. They are favorites of the kids...maybe I can pick up a few if they still have them.